What was the turnover of our Gucci products at the Amsterdam store in 2017 and 2018? Are there more men or women who place orders over 100 euros during working hours? What is the average number of years of service for our inside sales employees in London and in Amsterdam? Asking questions in natural language in your BI & Analytics environment ensures more intensive use and acceptance. The value of such a solution is suddenly unaffordable! Everywhere you read that companies which make better use of their data perform better than their competitors. This focus on “data-driven” provides insights and makes correct decisions possible to for example increase sales or lower costs. Capturing and analyzing data is important to every organization and seems obvious. But if you look honestly at your own organization; don’t you feel that a lot of important information is being missed? One of the reasons for this is, in my opinion, that the users of the data are almost never data experts. I call them irreverent “data dummy”. They are often managers or employees who work in various functional departments. Sales managers, HR managers, controllers, marketers or buyers for example. If you ask them what insight they need, they know it at the main level but not at the detail level. They often don’t know what the data has to offer them. A “bin” of data consists of tables with fields and rows. This can be huge and might originate from various source systems. They often have cryptic names or abbreviations and unfortunately also often the same names. Take an ERP or CRM system: the field “owner”, “amount”, “source”, “account” or “revenue” is very common in various tables. How do you know if you are using and combining the right fields from the right tables? Only a “data genius” knows its way around this; a data expert who translates the end user’s question into (sometimes very complex) “queries” with underlying logic. The fact that a user doesn’t feel comfortable using the BI system because this requires too much knowledge and experience means that the available data is not optimally used. An end user must be able to play with the data himself/herself, get a feel for it and have fun in diving deeper and deeper into the data. Only then will he or she thoroughly understand the data, be able to find interesting relationships, explain deviations in the data, draw conclusions and take action. Fortunately, the technique of converting from natural language to unambiguous language that the software understands is now available. And that is a party for the user: we can all become a data genius! 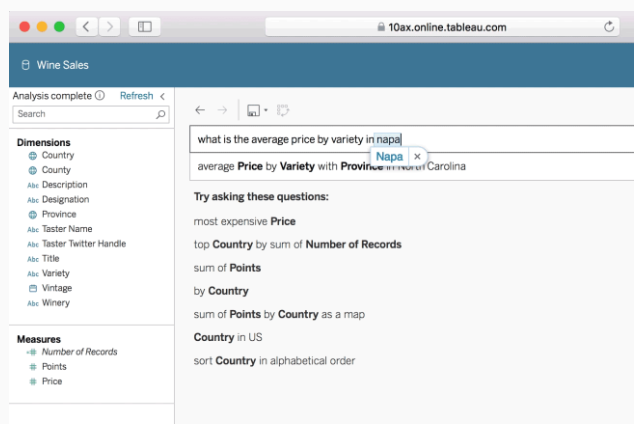 A good example of the use of natural language is the new “Ask Data” function of self-service BI & Analytics solution Tableau. Read more here including a short demo or download a free trial from Tableau.